Big mess of tables no more. Inker provides all the mechanics for creating sane email templates and keeping a clean codebase. Inker requires npm & grunt to be already installed. You have now everything you need to use inker. Your first stop would be the examples folder in src/templates to help you get started. base.scss is importing all needed files for inker, if you add a css component you must import it in base.scss. Responsive rules are in the folder 8_trumps, please note that these rules are added to the document's head instead of inlined using data-ignore="ignore" in the html templates. Open 7_themes, you will see there is already a folder called sidebarhero used for the sidebar hero template. Add a new folder in 7_themes for your template, your main css file will be automatically generated in dist/css/[your folder]. Inker uses Mozilla Nunjucks to build html templates, please see nunjucks' documentation for more information on how you can take inker even further. // Import the component in the base.html file in components folder. Open the template's folder, you should see a folder transactional, You can add your own folder here. There is a bit of a duality with Inker, it uses a templating engine to generate templates but must not use it to render personalized data on first render so that it can be generated by another templating engine or by the server. Inker enables you to use a custom syntax so that it does not interfere with your templating engine of choice. If you do use a custom syntax, you will have to replace the current implementation with the new syntax. Inker can use json files as a source of dynamic data. Please note that you can also use the provided rest api to test custom data. This is a built-in feature of grunt-nunjucks-2-html. Please refer to campaign monitor chart to see which email client supports video, fallback to an image. Inker can generate the same template in multiple languages. Strings are defined in the folder locales in the yaml format. Don't forget that inker pre-generate templates, strings are not generated on the fly. You can set default rendering languages in the gruntfile.js in the nunjucks section. Follow the same conventions while creating your localization files, in this case it would be locales/en_US.yml. By adding schema.org markup to the emails you send your users, you can make that information available across their Google experience, and make it easy for users to take quick action. Inbox, Gmail, Google Calendar, Google Search, and Google Now all already use this structured data. Inker currently only implement actions. JSON LD components use dynamic data generally linked directly to the customer you are sending the email. JSON-LD complete implementation is available using the Inker API or you can customize the components to use your own templating engine. JSON-LD content is a script tag embedded in the email body, this is already taken care of by Inker. "gotoName" : "Watch the 'Avengers' movie online"
Go-To Actions take the user to your website where the action can be completed. Unlike One Click Actions, go-to actions can be interacted with multiple times. 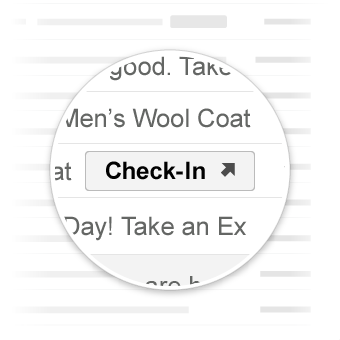 You may add a one-click confirm button to emails requiring users to approve, confirm and acknowledge something. Once the user clicks on the button, an http request will be issued from Google to your service, recording the confirmation. ConfirmAction can only be interacted with once. Use to declare a review action. Gmail may show a review button next to the email, which will prompt the user for a numeric review value and or a user comment. Inker uses grunt-nodemailer to send tests. You can easily change what email templates is being sent in the gruntfile.js. However a better way to use it would be to change the path directly from the grunt command. This makes it possible to send tests really fast with different templates. You must set the testing email provided by Email on Acid in the gruntfile. The most used email clients are already set in the gruntfile. Inker comes with a nodejs rest api that can handle rendering templates with custom variables and send emails through SMTP to any email provider. There is a public Postman collection for your convenience for testing the api locally. The API also uses nunjucks to render custom variables. Remember that since we use the same rendering engine (nunjucks) for both front-end & server side, you must use strings in your template to add variables and custom template logics. You can configure the template syntax in /src/server/config.js. When enabling the text version option, the api will automatically fetch the .txt file at the same folder level as the html version. // Enable text version using a custom txt template. Inker can log errors & alert you when one your main email sending provider is down, when an application request an inexistent template or when there is an error in a template. // loggers is passed bavk & contains all the logs providers. A big thank you for supporting Inker. Email on Acid - Tools that simplify email testing and analytics. I'm always happy to accept contributions, I'm currently looking for more components and examples, but please follow ITCSS guidelines, and please test your new components in the most used email clients.